When is a DAC not a DAC? Now, this is a rare and exotic creature - a digital to analogue converter that will handle 384kHz files. There are not many DACs that can do that. The only other one I've heard is the MSB Signature IV - which is stunning – but then it should be since it costs around twenty times the cost of this KingRex unit. Even the Antelope Audio Zodiac Gold, which will also do it, is over £2K. So, if you are on a budget and have a stack of 384khz high res files with nothing to play them on, read no further - this looks like a no brainer at the price. But let's face it, there is pitifully little high resolution material available at any data rates and only a few albums at 384kHz. So there's likely to be a bit more to any decision than that. Let's have a look at it. The KingRex UD384 is a small metal case, about the size of a cigarette packet, with sockets at each end. It is supplied with a "wall wart" power supply. One end of the unit has the power socket, a lamp confirming power is present and a USB socket. The other end has one stereo pair of RCA sockets and an RCA style coaxial digital output. The top and bottom are screen printed with the KingRex logo and details such as the serial number. A separate battery power supply, the "UPower", is also available although my testing was done with the stock power supply. It comes with a basic USB cable and a small format compact disc containing the software drivers it needs to allow it to communicate with a PC. It feels simple and well put together. Although small, the curved case is solid, the paint finish fine and the sockets good quality. It's not the sort of thing you'll show off to your neighbours but that's not really what it's about. The UD384 is actually two devices in one. It can be used as either as a USB DAC on its own or as an asynchronous converter which takes data from its USB input and feeds to a separate DAC. I'll talk a bit more about this later in the review. This is not a simple Windows "Plug and Play" device. I was given a pre-launch version of the DAC initially which required a lot (literally hours) of software fiddling - and (friendly) support from KingRex - to get to work. Since then I've been using a later, production, version which was much simpler by comparison. Even so, I found it wouldn't work at first and I needed to update to the latest version of MediaMonkey and reinstall ASIO4ALL to make it work fully, but this was not too onerous. Once the software is loaded, it's just a case of connecting the cables according to what you want to use it for - and away you go. The connection will be different according to whether you are using it as a DAC, in which case you will simply connect to an amplifier using RCA cables or as an asynchronous USB buffer for which you will connect to a DAC using the coaxial output. As a DAC the UD384 is very basic, at least from the perspective of the facilities on offer. It has a single input - a USB one - so it can only be used with a computer. It cannot, like several DACs I have reviewed in the last year, be used as a hub for multiple transports, or even to upgrade an old CD player. It can't be used alone with an iPod or a USB disk. It has no display, apart from a power on lamp, so it is not possible to confirm that the data rate you believe you are sending is that which the DAC is receiving. But there's no point criticising it for not being something it is not. Its real qualities as a DAC are in the data rates it is able to process from that single USB connection and in the sounds it produces. It is fundamentally a high quality alternative to an internal soundcard for a PC audio set up rather than a "traditional" DAC. Many DACs are limited to 44 or 48kHz files over USB. Fewer, more recent, machines will accept 96kHz. A handful will accept 192kHz, although most 192kHz DACs will only accept that data rate over a connection other than USB. The UD384 will accept all the standard data rates from 44kHz to 384kHz with the slightly strange exception of 352kHz, which for some reason it is unable to process. So the UD384 is far ahead of most of its competitors in its acceptance of high data rates even if its facility count is very low. In that, it is a very specialised device. I tried the UD384 in both of my systems and it performed pretty consistently across the two. As a simple USB DAC the sound was clean and clear with good body and a wide soundstage. The overall, already good, impression improved markedly as data rates increased. To take some examples, the entry of the drums and bass on "St Theresa" by Joan Osborne (from the album Relish) should really get the track kicking along. All present and correct in this case - the UD384 delivered plenty of bass energy and dynamics to get it moving. Turning to the "Baroque Reflections" album by Alessio Bax, a very well recorded album of solo piano, there was no harshness or exaggeration of leading edges, the standard rate file sounding smooth but with plenty of detail to draw you into the playing. The piano sounded natural and comfortable in a wide and well defined acoustic space. One of my standard test tracks, Rebecca Pigeon's rendering for Chesky of "Spanish Harlem", exhibited the spaciousness needed to allow the acoustic to breathe as well as the depth to deliver the double bass that underpins the music. Moving up to higher data rates the performance improved accordingly. Greater accuracy of timbre and soundstage depth were the chief characteristics I noted on the 24-88 release of Ray Charles' "Genius Loves Company" album. The music had an improved sense of realism – individual instruments sounding fuller, within a bigger stage, than with the Cambridge Audio DacMagic (my budget reference). The same effect was evident with the 24-96 version of Buena Vista Social Club making it easy to pick out the individual strands of the arrangements whilst the detail of the reverb decays held the sound together in a common acoustic. By the time we reached 384kHz material, downloaded from the Norwegian label 2L, the sound was spectacularly lifelike – with even my wife commenting on the realism of the orchestral presentation. Taken all round, the sound was superior to the Cambridge Audio (itself a very good converter, belying its relatively low cost) but fell short of some more expensive DACs I have heard recently. The soundstage was slightly narrower than the Marantz I normally use, although there was little to choose otherwise. The rendering of instruments was less lifelike than the Antelope Audio Zodiac Plus I reviewed a while ago and it did not have the characteristic bass power of the Wyred4Sound DAC1. In summary, not a giant killer but a good, sound converter. "Sorry, as a WHAT?? ", I imagine you asking. As I mentioned above, the majority of DACs will only accept data rates higher than 48kHz over their coaxial or optical inputs, not USB. It is also often the case that the sound quality of the USB input is inferior to that via the other interfaces. A USB to S/PDIF converter, or buffer, is designed to overcome these issues. It takes a USB input and converts it to S/PDIF, usually delivered over a conventional 75ohm digital co-axial connection. I already use a KingRex buffer, the UC192, in my main system as it improves the sound from the Marantz SA-KI Lite that I use as both a DAC and an SACD player. Although the Marantz has a 96kHz USB input the UC192 is still worthwhile. Files played directly through the USB input on the Marantz sound flat and lifeless but when converted and played into the coaxial S/PDIF input they come to life. Dynamics improve and the soundstage opens out. The UD384 performs similarly but has a more pronounced effect than the UC192. It's particularly noticeable in the width of the soundstage, which expands considerably with the UD384 in circuit. I also compared the sound of the UD384 via the Marantz to that achieved using my Kingrex UC192 converter and also the DacMagic (purely as a USB to S/PDIF converter). Those experiments confirmed that the difference in sound achieved using a buffer is about more than just the difference between the two input circuits on the Marantz. It is likely to be due to better jitter performance - which seems to reduce harshness and improve imaging. The effect probably results from the KingRex processing achieving lower jitter by using its own clock to synchronise the data stream. The UD384, as an asynchronous buffer potentially controls jitter more completely than other implementations. In my somewhat simplistic understanding, the term "asynchronous" in this context means that the buffer uses its own digital clock to control the timing of the data stream arriving from the computer, ensuring it arrives and is processed consistently. The opposite approach ("adaptive") takes the data from the computer "as it comes" and sorts it out in the buffer. And the end result generally is a bigger sound with more body and less digital edge from an asynchronous device, all other things being equal. I started to suspect that what I liked about the sound of the UD384 was actually more to do with its performance as a buffer than as a DAC. To check this, I connected its S/PDIF output to the coaxial input of the DacMagic and both DACs to adjacent channels on an amplifier (in this case a Lym Audio 1.0T, review coming soon), and switched between listening to the two converters. This meant that both data streams were enjoying the same asynchronous buffering from the PC so any differences in sound would be down to subsequent stages – the digital to analogue conversion and associated output electronics. It also made A/B switching a simple matter of switching amplifier channels. In this configuration the sound of the two channels was virtually indistinguishable. When the DacMagic was fed the asynchronous data stream from the UD384 its sound was very, very similar to the audio outputs from the UD384 itself. 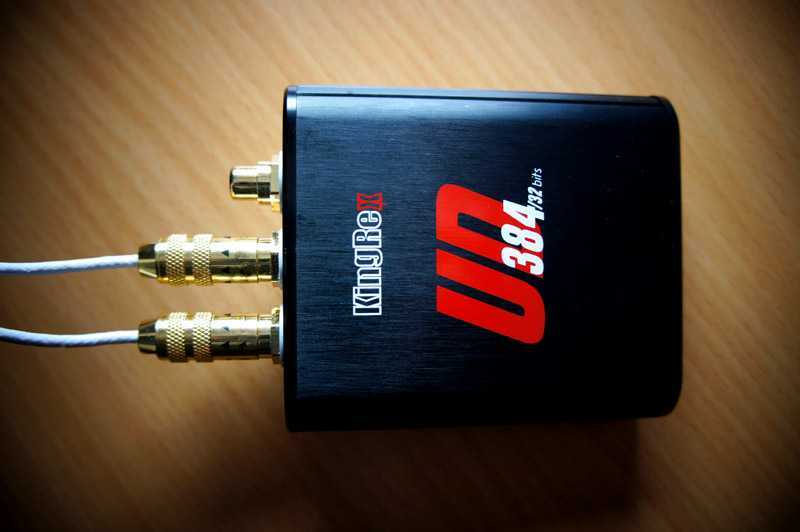 It follows that what was making the big difference between the DACs on my initial tests was the UD384's capability as a buffer and S/PDIF converter, rather than the quality of the digital to analogue conversion. This is a good USB DAC for specialised use with a computer. Its sound is broadly consistent with its market positioning and its performance with 384kHz files clearly distinguishes it from its immediate competition. That distinction though comes at the cost of very limited facilities. It performs very well as a premium USB to S/PDIF converter and is worth an audition in that role alone, in which case one might consider the DAC as a bonus. It is a shame there is not more 384kHz material out there to listen to. The Norwegian label "2L" does offer a range but they seem to be ploughing a lonely furrow. Of course it is something of a "chicken and egg" situation in that labels are not likely to convert masters to that data rate (and many digital recordings have been made at lower rates anyway), unless there are customers for that higher resolution. And there won't be customers without converters. It will be interesting to see over the coming years whether the KingRex UD384 is a real pathfinder product or whether it leads to blind alley – albeit a high resolution one.